A man surveys damage caused by the earthquakes and tsunami in Palu, central Sulawesi, Indonesia, Saturday. Hundreds of people were killed. A house in Donggala on the Indonesian island of Sulawesi sits damaged after an earthquake early Friday. "Many bodies were found along the shoreline because of the tsunami," he said earlier. Hundreds of people were on hand for a beach festival, which would have started Friday night. Nugroho tweeted photos of the damage in the city of Palu. Nugroho earlier said four hospitals in Palu reported 48 people dead, though also said "many victims" are still unaccounted for, according to the Associated Press. The wire service said a reporter saw "numerous bodies in a hard-hit city," which "was strewn with debris from collapsed buildings." 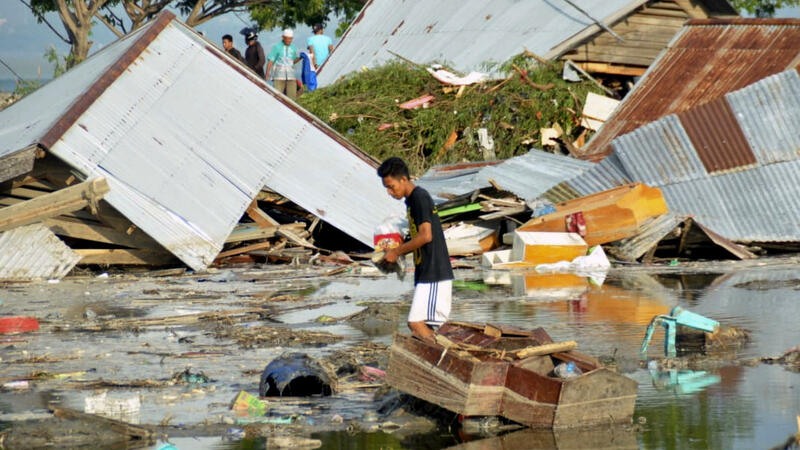 Nugroho told reporters the damage was "extensive," with thousands of buildings destroyed. Damaged roads and power and communication outages were reportedly hindering rescue efforts. The U.S. Geological Survey said a 7.5 magnitude quake just 6 miles deep hit a sparsely populated area in the early evening. The epicenter was about 50 miles north of Palu. The strong quake followed a milder 6.1 magnitude temblor hours earlier in the same area. More than a dozen other earthquakes with a magnitude of at least 5.0 hit the same area of Sulawesi over the course of several hours, the USGS said. Indonesia's Meteorology, Climatology and Geophysics Agency initially announced that the largest quake was "not capable of generating a tsunami affecting the Indian Ocean region." However, agency chief Dwikorita Karnawati later told Reuters that a tsunami had struck Palu, located on the Makassar Strait, which connects the Celebes and Java seas. "The 1.5- to 2-meter [6 1/2-foot] tsunami has receded," Karnawati told the news service. "The situation is chaotic, people are running on the streets and buildings collapsed. There is a ship washed ashore." An official of the Central Sulawesi Museum in Palu told The Jakarta Post, "Yes, there was a smashing of seawater." Then, the newspaper reported, the phone connection "broke down." Nugroho said the city of Donggala was also hit by the tsunami, the AP reported. "The cut to telecommunications and darkness are hampering efforts to obtain information," he said, according to the AP. "All national potential will be deployed, and tomorrow morning we will deploy Hercules and helicopters to provide assistance in tsunami-affected areas." The devastating South Asian tsunami in 2004 brought waves that witnesses in Aceh Province, Indonesia, said were 50 to 70 feet tall, NPR reported. As NPR's Mark Memmott has noted, "an estimated 230,000 people died after an earthquake triggered a massive tsunami that devastated South Asian coasts from Indonesia to Thailand, Sri Lanka and India." 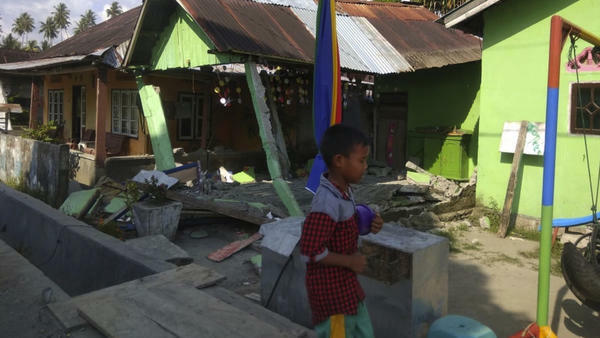 In August, more than 500 were killed in an earthquake that struck Indonesia's Lombok island.